Which Hotel REITs Achieved the Highest Hotel EBITDA Margins and the Lowest Management and Overhead Expense Ratios in 2015? Private equity funds, family offices, and other investors have several choices when seeking to increase exposure to real estate, specifically within the hotel sector. They can buy hotels, build hotels, invest in hotel mortgages, or invest in joint ventures that own or develop hotels. Perhaps one of the easiest methods of investing in hotel real estate, however, is simply to purchase shares of Real Estate Investment Trusts (REITs) that own hotels. Some REITs are more effective than others at generating earnings and passing profits on to investors. This article examines two simple metrics that Hotel Appraisers & Advisors, LLC monitors for 16 publicly traded hotel REITs. 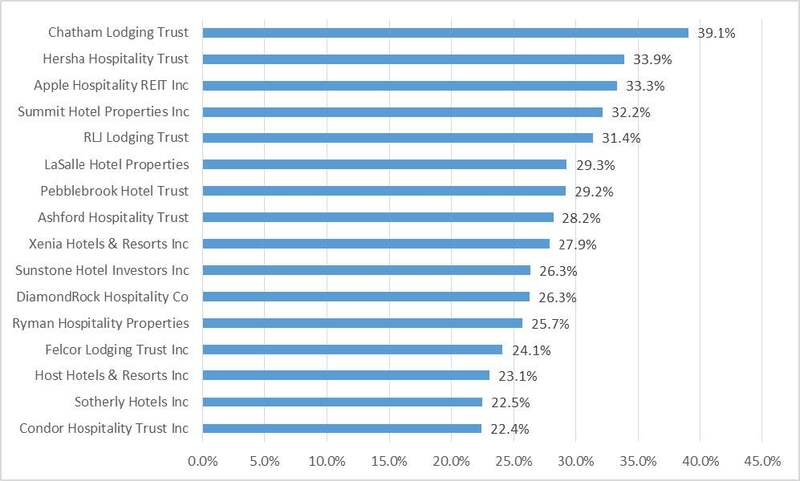 Firstly, we observed the average profit margins of each REIT’s hotel portfolio. We calculated this by isolating each REIT’s hotel-generated earnings before interest, taxes, depreciation, and amortization (EBITDA), expressed as a percentage of hotel operating revenues derived from hotels owned by the REITs. We applied a standardized reserve for replacement expense to each REIT’s portfolio, equivalent to 4.0 percent of annual hotel operating revenues, when calculating the hotel EBITDA amounts. This ratio is one simple metric that allows investors to measure how profitable the hotels are that each REIT has purchased. This metric helps investors understand how efficient each REIT’s hotels are at converting revenues into profits. Figure 1 illustrates that hotel REITs exhibit a wide range of profitability for their hotel portfolios. The figure shows hotel EBITDA ratios that range from 22.4 percent to 39.1 percent of total hotel operating revenues, for each REIT’s hotel portfolio in 2015. In general, limited-service and select-service hotels can be operated more efficiently than full-service hotels and resorts. Newer hotels and hotels in higher-rated markets also tend to produce higher profit margins than older hotels or hotels in lower-rated markets. As such, it is not surprising that all five of the hotel REITs that scored highest on this metric for 2015 have portfolios primarily containing limited-service and select-service hotels, primarily in highly-rated destinations or urban markets. Secondly, Hotel Appraisers & Advisors, LLC also evaluated a rough indicator of how expensive it is for the REITs to manage and administer their hotel portfolios. Investors in hotel REITs have at least two layers of managers and administrators that must be paid. Firstly, REITs typically hire professional hotel management companies to oversee the day-to-day operations of each hotel they own. In addition to paying for labor and other operating expenses at the hotels, the REITs must pay a professional fee to each of the management companies they retain to manage property-level hiring, training, reporting, and other management duties. This expense is called the hotel management fee. Additionally, each REIT’s internal staff that hires and evaluates these hotel management companies, among other tasks, also gets paid and incurs expenses. These expenses are typically called corporate general and administrative expenses, or something similar. Together, the sum of the hotel management fees and the REITs’ corporate general and administrative expenses represent a rough gauge of how much it costs investors to extract profits from each REIT’s portfolio of hotel assets. For this comparison, we combined certain expense items found in most hotel REITs’ annual reports. For the purpose of this article, we sum each REIT’s 2015 base management fees, incentive management fees, and corporate overhead expenses, including corporate general and administrative expenses as well as advisory service fees. We then compare these expenses to each REIT’s 2015 hotel earnings before management fees are deducted. 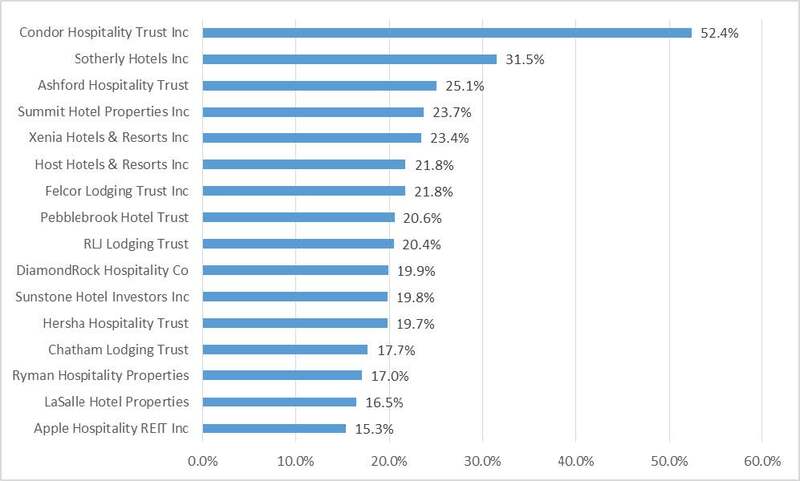 Figure 2 illustrates a wide range of performance among the REITs on this metric. For every dollar of earnings generated by the hotels in a REIT’s portfolio, somewhere between 15 cents and 53 cents were spent on hotel management and corporate overhead in 2015. These figures can vary from year to year and numerous other factors should be considered by investors. However, all else equal, investors may generally prefer to gain exposure to hotel portfolios with higher operating profit margins and lower management and corporate overhead expenses. This article is for discussion purposes only and is not intended to be construed as investment advice. Hans Detlefsen, MPP, MAI is president of Hotel Appraisers & Advisors, LLC. Mr. Detlefsen is a designated member of the Appraisal Institute. Prior to forming Hotel Appraisers & Advisors, Hans owned the Chicago office of HVS, a global hospitality consulting firm. He received his B.A. from the University of Notre Dame and his M.P.P. from the University of Chicago. Hans is a frequent speaker at industry conferences and has been cited in numerous business journals and trade publications. Hotel Cap Rates Inching Up: Is It a Good Time to Sell Hotels?